This uniquely organized text gives both students and working professionals graphically detailed assistance in understanding the underlying principles of die design, illustrating how these basic engineering principles are easily adapted to a limitless variety of die designs. Introduces recent developments in die design tools such as hydraulic presses. Covers materials, punches, die sets, stops, strippers, gages, pilots and presses. Divides the design of each die into a series of distinct, easy to follow steps. Illustrates each step in pictorial view and as a portion of an engineering drawing. 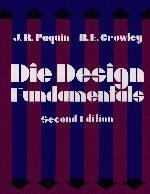 Introduces the elements of mathematics used in the design of die components. Introduction to Die Design. Presses and Press Accessories. The Material Strip. The Blank. Fourteen Steps to Design a Die. How to Lay Out a Scrap Strip. How to Design Die Blocks. How to Design Blanking Punches. How to Design Piercing Punches. How to Design Punch Plates. How to Design Pilots. How to Design Gages. How to Design Finger Stops. How to Design Automatic Stops. How to Design Strippers. How to Apply Fasteners. How to Select a Die Set. Dimensions and Notes. The Bill of Material. Types of Dies.